The Life and Times of Lilly the Lash® is a fun and adventurous children’s books series, where an EYELASH teaches important life lessons and how to build strong self-esteem and good character. The first book of the series, The Garden Gathering, addresses the issue of self-image and learning to love ourselves just as we are. 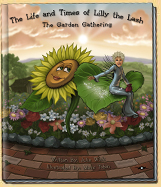 Lilly the Lash finds herself in a garden where Sunny the sunflower has grown much larger than the other flowers, and somewhere along the way, has lost her self- worth. Lilly brings a teeny tiny spider named Arnie onto the scene to help Sunny realize that regardless of our size, we all have value. In the end, Lilly’s message makes it clear to everyone that having a POSITIVE SELF-IMAGE is important, as we’re all part of the big puzzle that makes this world complete. The cleverly written storylines are told in a rhythmic style, and the magnificently animated illustrations are both enchanting and mesmerizing. The age range for the series is 0–10, although truly appropriate for ALL ages! Loved by boys and girls alike, Lilly the Lash, a slightly clumsy gal with a tomboyish edge, encourages children to use their imagination to go places only a minuscule eyelash could take them. Sizing in at 11 ½” x 10”, this glossy, hardcover book is durable and fun for the little ones to hold onto. The larger whimsical lettering used throughout the book allows for easier reading, and often assists with pronunciation and spelling. The pages have a water based, environmentally friendly aqueous coating which increases durability, enhances the vibrant colors of the ink, causing the cinematic images to POP off the page, and most notably, offers the reader a fabulous silky-to-the-touch experience. Each book in the series has three additional special pages; Fun Facts, What’s Next, and The Cause, which can be found in the back of the book. You will find three programs for each book in the series. Classic Classroom Lesson Plans, Diverse Directions Lesson Plans, and Creative Crafts. The Classic Classroom plans are	for children Pre-K to 5th Grade. The Diverse Directions plans are for various age levels, with an intentional focus on children with such issues as ADHD, Autism, or similar hurdles. These, along with the Creative Crafts activities, can be utilized by teachers in school, or parents and grandparents at home.